Celexa (Citalopram) belongs to a class of drugs known as selective serotonin reuptake inhibitors (SSRIs) and is an anti-depressant. Being an SSR inhibitor, Celexa is used to treat the symptoms of major depression, social anxiety disorder, panic disorder and OCD. It helps to maintain the right balance of chemicals in the brain and thereby prevents depression from setting in. Celexa comes in the form of a tablet and is to be consumed orally. The drug is considered safe and well-tolerated in the therapeutic dose range of 10 to 60 mg/day. However, it is recommended that you follow a dosage as indicated by your doctor. You can consume it before or after a meal. 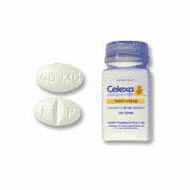 A typical treatment cycle with Celexa lasts for a minimum period of 1 month. If you have missed a dose of Celexa, then take it as soon as you remember only if there is ample time before the next dose. Or else, skip one dosage. Do not take a double dose. Store this medication at room temperature 15–30°C (59–86°F). Avoid storing in direct light and moist places (bathroom). Keep away from children. Usage of Celexa should be monitored by a doctor. Maintain caution when driving, operating machinery, or performing other hazardous activities.